Sterling silver, real Turquoise, Coral, Jet, Abalone Shell, Pink Shell and Mother of Pearl. 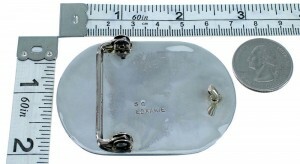 Belt buckle measures approximately 1-7/8" long, 2-3/4" at widest, and will fit a belt that is up to 1-1/4" wide. 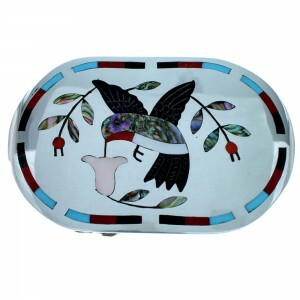 This lovely belt buckle is a work of art and has everything you could possibly want from a piece of Native American jewelry! This piece of Native American jewelry is Zuni hand crafted by artist S.C. Edaakie, out of genuine sterling silver and real multicolor inlay. The inlay consists of: Turquoise, Coral, Jet, Abalone Shell, Pink Shell and Mother of Pearl. The inlay is delicately set, creating a remarkable Hummingbird design for an elegant look. Hummingbirds are mainly known to be defenders of their territory. Many times stronger than their small size would indicate. The buckle is hallmarked by the artist.